As you probably know by now, Southwest Airlines announced their intention to serve Hawaii this past Wednesday night. There has been speculation about if and when Southwest Airlines would begin service to Hawaii for years. Driving these rumors is the fact that they've been removing many of the obstacles holding them back from flying to the islands. For instance, flying long distances over water requires specially equipped and maintained aircraft. Known as Extended Operations (ETOPS) certification, the aircraft and crew have to demonstrate an ability to lose an engine and to safely divert to an alternate airport. Southwest has been operating ETOPS compliant aircraft, and trained their crews in over water navigation procedures several years ago. So why did they wait so long to start service? One reason to not serve the Hawaiian Islands is that it is a very difficult market in which to make money. This may seem counterintuitive as Hawaii is one of the premier vacation destinations in the world, but let me explain. Airlines rely on two types of passengers to make money: business and leisure. Business passengers are by far the more profitable customers as they are usually on a tight timeline, and are not generally flexible in their travel plans. Many times they have to travel at the last minute. These factors mean that airlines can charge business passengers a lot of money which ends up making them high margin customers. Leisure passengers, on the other hand, often plan their vacations well in advance, and are more cost conscious as opposed to time sensitive. Add in that money used for vacations is discretionary, meaning that a small increase in cost may mean going to a cheaper destination or not going at all, and you can see that airlines are competing for these passengers on price. The leisure market ends up being a high volume, but low margin business. And Hawaii is the quintessential leisure market. Another factor in the Hawaiian market is of the airlines' own making. That factor is their loyalty programs. Decades ago, the airlines figured out that giving away free flights to loyal customers was a great way to keep those customers from jumping ship (so to speak) to another carrier which beat them by a few bucks on price. One of the premier destinations for loyalty program redemptions, however, was Hawaii. This meant that the airlines found themselves flying full airplanes to the islands with very few paying customers, a huge number of them being redeemed "miles" flights. The type of aircraft being flown can also affect the profitability of a particular market. Wide-body aircraft carrying several hundred passengers enjoy an economy of scale which lowers costs. The fixed costs of maintaining gates and ticket counters are essentially the same for all airliners, so an airline flying wide-body aircraft can spread those costs over more customers. This is a disadvantage for airlines with only narrow-body aircraft such as Alaska and Southwest. All of these reasons have made Hawaii a difficult market that up to now Southwest has elected to forego. But something made them change their mind, and that something was from outside their company. In April of 2016, Alaska Airlines announced their intention to acquire Virgin America creating a west coast powerhouse airline with national aspirations. For decades, Alaska was content to serve their fiercely defended home turf of Alaska from their Seattle hub, along with west coast routes including Mexico, while only occasionally venturing east of the Mississippi. The addition of the Virgin America network added a robust transcontinental capacity giving the new entity a significant east coast footprint. They also decided that the time was good to challenge Southwest for primacy in one of the largest markets in the country: California. Southwest has long been the primary carrier for California intrastate travel having wrested the old PSA routes away from USAir back in the early '90s. Flying California intrastate routes as many as six times daily, Southwest has more or less had that market sewn up until earlier this year. Starting in March, Alaska announced new service and frequency to cities such as Burbank and Sacramento, Southwest strongholds. A fare war has subsequently broken out with fares as low as $57 for intrastate travel. Fare wars, while good for airline travellers while they last, can be brutal to the bottom line. Alaska did not start this fight without intending to either win, (unlikely) or at least to grab a good chunk of Southwest's California market share. 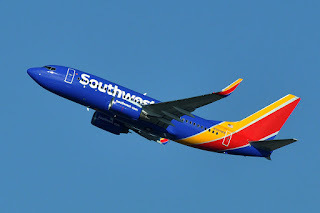 A war of attrition will batter both airlines' financial results even though Southwest is somewhat better positioned to prevail as they have lower overall costs than Alaska. Alaska, though, does have some tricks up their sleeve which will keep them in the fight. One is that they have codeshare agreements with 15 other airlines to include large international carriers like British Airways and Emirates. Southwest does not codeshare at all. Funneling passengers into a worldwide network brings in revenue and exposes their product to more potential customers. The other feature that Alaska has is Hawaii. They've been flying there for years, even though it may not be a huge revenue generator. And this is an ace in the hole when you are fighting for California. As it turns out, over half of all Hawaii tourists originate from California. The whole point of loyalty programs is to capture customers who will then fly one particular airline for both business and leisure travel. When you are trying to build brand loyalty, as Southwest is, not serving one of the largest nearby leisure destinations means that you are inviting your customers to fly on your biggest competitor. This is the real reason that Southwest has finally decided to fly to Hawaii. A fare war over California means that there are huge consequences at stake. Alaska is attempting to establish a larger presence on the west coast after their merger with Virgin America, while Southwest does not intend to let one of their largest markets be challenged. In order to compete against this new attack, Southwest has to offer their customers access to Hawaii unless they want to see their customers fly on the competition for both business and leisure. Captain Rob Graves is a veteran airline pilot and retired Air Force officer. He currently flies a Boeing 737 for a major American airline where he has over 25 years of experience. His Air Force career included instructing future USAF pilots in the T-37 primary jet trainer, aerial refueling in the KC-135 Stratotanker, and conducting worldwide logistics in the C-5 Galaxy cargo aircraft. He is the author of This is Your Captain Speaking, an aviation blog. It can be found at robertgraves.com. He also writes for Avgeekery.com. Any opinions expressed are solely his. Is there an option for Southwest to capitulate and begin codesharing with a network? Wouldn't this seem to be an efficient and effective way to mitigate the advantage Alaska has? I realize that Southwest has always been a bit "isolationist" but if they want to expand to other routes, won't codesharing become a necessity? I think that you're correct in your thinking Jim. They might need to come to some agreement with their unions, but codesharing is probably in their future in some form or other.